While turmoil at the top plays out on the world stage we could all benefit by emulating the National Association of TV Program Executives code of conduct – where a return to Decency – Diplomacy – and High Stakes Negotiations carry the day. Miami Beach , Fl/ January 30, 2018 While the other West Wing’s unscripted drama has come to resemble a savage, ‘Lord of the Flies’ cauldron of chaos – over 5000 attendees at this month’s NATPE (National Association of Production TV Executives) Market and Conference in Miami Beach served as a poignant demonstration of how 35 nations can work in tandem while furthering respectful debate and high level negotiations. The world’s highest rated reality show gains a near-universal, shell -shocked audience starring a motley crew of political aids (that are either wildly incompetent or utterly defeated) in their attempt to reign in a corrupt, disingenuous, infantile and unhinged headliner. In an era of ‘anything goes and no one is immune’ the toxic seepage of sexual scandal, purveyors of blatant business misconduct and the corruptible forces marring the demigods of the broadcast, fashion, commercial photography and the movie industries continue to capture headlines. In stark contrast guests at NATPE, both men and women adhere to a code of conduct befitting professionals, irrespective of gender. 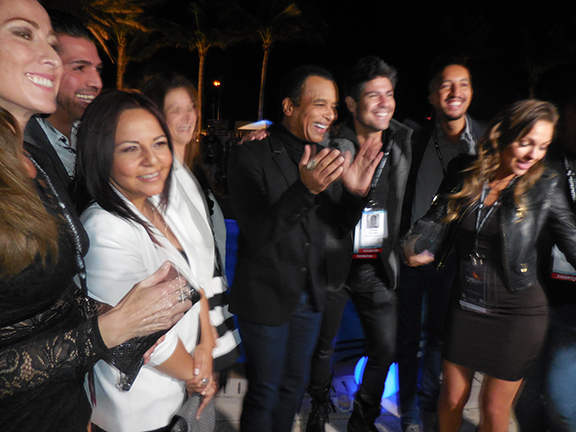 The NATPE market and conference unspooled January 16-18 serving as an oasis for social and business engagements conducted in hushed tones that were both dignified and democratic. In its 53rd year, the NAPE confab has migrated from its heyday in Las Vegas with a short layover in New Orleans to take up permanent residence in Miami Beach 5 years ago. At the nexus of North & South America, Europe and increasingly Asia, Africa and Australia; the tone on the floor was respectful of varying view points and cultural differences. Content providers representing countless genres focused on the ethos of “build a better today – so we might live tomorrow”, stated Sasha Yabraian a consultant on the engaging track of panel discussions and master classes that included appearances by Jane Fonda, Tom Selleck and writer -producer Greg Berlanti. Organizers brought together 200 influential speakers, 5000 top media executives, 350 global exhibitors, 1100 program content buyers and celebrities that also included Ru Paul and John Oliver among them. The hum and strum of proceedings was nothing if not congenial , dignified , diversified and inclusive. Web casters were in hot pursuit to develop, produce and/or license original digital content and programming. The goal was to engage an ever expanding online and diminishing linear audience. Innovative delivery systems, web based platforms, new cable and service providers all served to extend the democratization of the distribution process. Kudos to NATPE’s permanent home at the Fontainebleau and adjacent Eden Rock. The professional staff seamlessly attended to the needs of over 5000 NATPE guests. To wit, this writer’s evening clutch and mobile phone went missing. Both items were returned by an alert security representative within minutes. Commemorating opening night; several thousand guests were hosted under the stars with an array of succulent and steaming dishes. Generous portions of broiled fish , three distinct pasta stations, a Mexican themed taco bar and mezze platters of finger licking hummus, baba ganoush and garden fresh crudités were paired with fine California wines. The menu and its presentation rivaled that of any South Beach gourmet establishment. Grammy Award winning Elvis Crespo and Jon Secada entertained with their sizzling orchestra with guests swaying to cumbia, salsa and rousing meringue beats.